Commercial shutters are the ideal choice for buildings such as retails units, shopping centres, schools, health centres, offices, football stadiums and local authority buildings. Ace Engineering supply and fit Commercial Shutters and Doors throughout Dublin and the rest of Ireland. 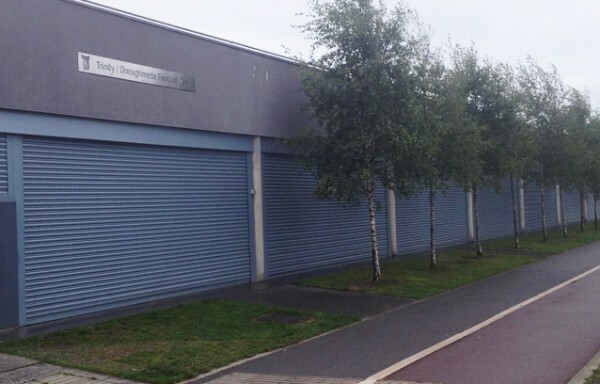 We provide a comprehensive range of commercial shutters in steel and aluminium available. There are a number of shutters styles available – perforated, punched and solid. Commercial shutters are also available in a wide range of colours. Our commercial shutter curtains are constructed from continuous interlocking galvanised steel laths, securely held in place by end locks. Bottom rails are generally galvanised and roll-formed into T-section. The vertical guides are formed from rolled steel or aluminum and supplied with fixing angles suitable for securing to the structure. The end plates are of prime painted mild steel of appropriate thickness relative to door size and supplied with fixing angles suitable for securing to the structure. The shutters can be operated by remote control, switches, group command control. We will install a backup power device used to provide an alternative source of power to allow a limited number of operations of the door, should the main power supply from the consumer unit fail. We can ensure that our roller doors are of the high quality and some of the most durable doors on the market. If you are looking to install commercial shutters or doors then call us now. We’ll provide you with a no obligation quote today. Ace Engineering have a prompt and efficient repairs service which operates 24 hours a day, 365 days a year and is available throughout Dublin and nationwide. We also offer an excellent after sales service to ensure your Commercial Shutters are operating efficiently.